Anyone else out there who thinks that finding unique hotels in amazing locations is one of the best aspects of trip planning? We just got back from a trip to Indonesia and our hotel in Uluwatu, The Temple Lodge, really took the cake. In fact, I think it’s my favorite place I’ve ever stayed. Yes, I’ve stayed at places with access to nicer beaches (or right on the beach), a great variety of amenities, and more attentive staff, but the combination of amazing views + incredibly unique rooms won me over. 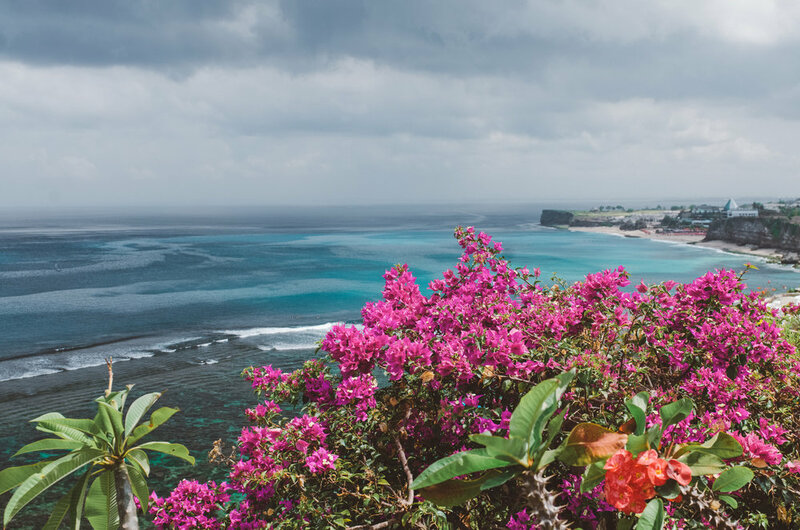 Uluwatu is a wonderful seaside location in southern Bali with a sleepier more relaxed vibe than places like Kuta and Seminyak. One of the main reasons people visit Uluwatu is for the world class surfing at places like Padang Padang (sometimes referred to as the Balinese Pipeline) and Bingin. Uluwatu became a surfing hotspot after the film Morning of the Earth, following surfers looking for perfect waves and finding many in the Uluwatu area, debuted in the 1970s. 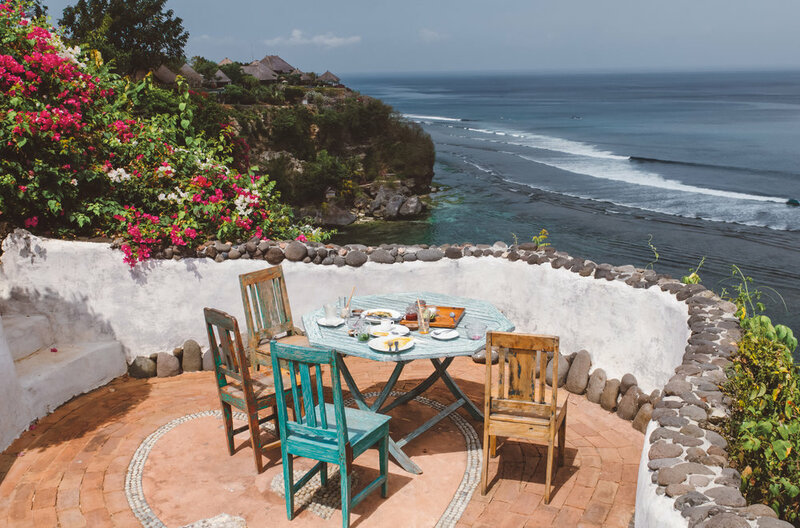 These days, Uluwatu boasts a wide variety of accommodations scattered amongst local homes on narrow winding streets with spectacular sea views from the region’s many cliffs. 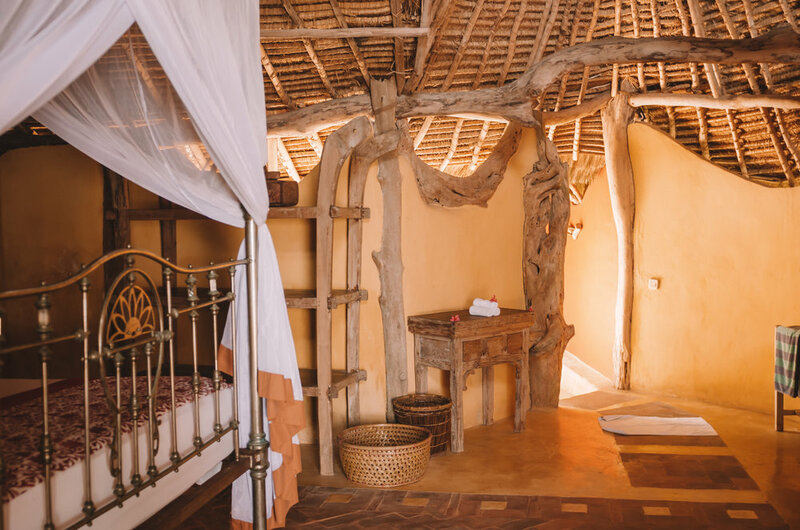 With just seven suites and a vibrant artistic aesthetic, The Temple Lodge has a very intimate vibe and the limited number of guests ensures that it never feels crowded. 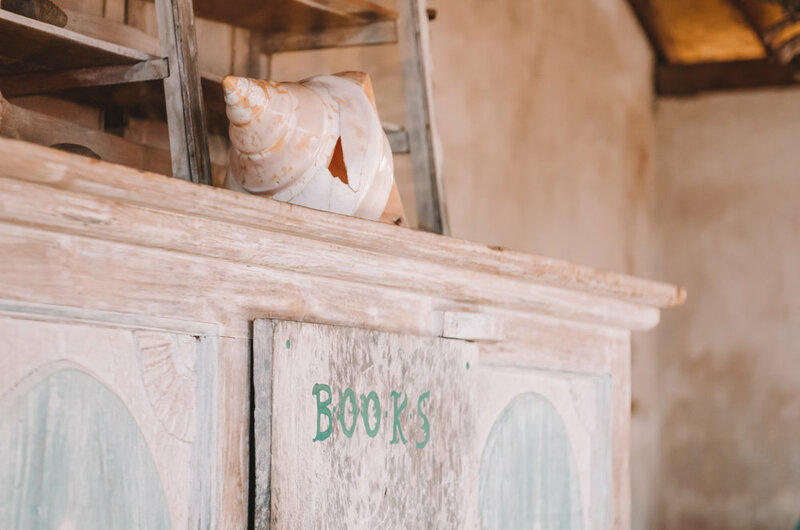 Every suite is completely different, with three (Coral Cave, Eagle’s Nest, and Gecko) located right on the edge of the cliff with insane ocean views. While I have to admit that I was disappointed initially that all the cliff side suites were booked out, our choice of the Driftwood suite, located just steps from the pool with a partial ocean view, ended up being an excellent one. The photo above is the outside of our fabulous hut. Now for a tour of the equally fabulous inside! That last photo was the view out our front door. You simply can’t get tired of a view like that. Aside from the phenomenal view, the first thing we noticed when we walked into our room was how absolutely massive it was. We booked for three adults and there was a gigantic king sized canopy bed with mosquito net and a single bed that also had a full mosquito net. Since the room was very open to the elements, which I personally loved, the mosquito nets were much appreciated. 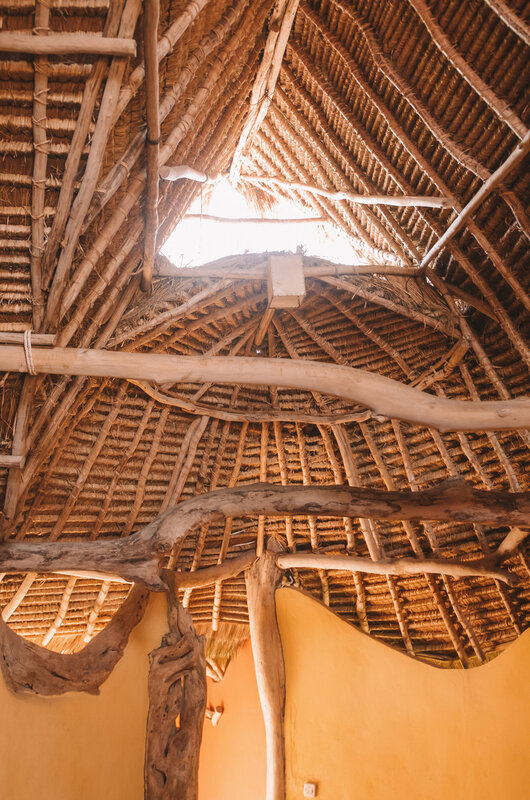 All the driftwood elements, after which the suite was named, were very enchanting and I loved the thatch roof. I also adored the open air bathroom that was basically a personal garden courtyard with a little hut at the end that contained the toilet. I also loved the fact that there was no door to the bathroom courtyard. Everything felt so open and connected to nature, especially when we got woken up our second morning by monkeys running around on the roof. We spent a lot of time in the pool. It was a really deep pool, which was nice, and the temperature always seemed just right. Pool towels were provided and there were no pool hours, which for us meant going for night swims. Alongside the pool and mere steps from our room was a delightful covered reading/hangout area with couches, tables, and used books. Although the grounds weren’t large, they were totally enchanting with a stone pathway leading through lush vegetation from the entrance to the pool area. A steam bath and yoga studio were located along the path, but since they weren’t complimentary we didn’t check them out. My favorite area of the grounds was a little walled patio with table and chairs right on the edge of the cliff past the end of the pool. The view from there was insane and it was also a great spot to watch the surfers. Breakfast was included and involved choosing anything we wanted from their expansive breakfast and drinks menu. There were tons of vegetarian and vegan options which was great for us, and the drinks menu had multiple pages of amazing blended beverages. For early risers, tea and coffee service began at 7:00 AM with breakfast proper served between 7:30 to 11:00 AM. And at the end of each day, we got to stand at the door to our room or lounge around the pool and take in incredible views like this. What more could you ask for? During our stay at The Temple Lodge, we truly felt like we were in paradise and it was so hard to leave. If I’m ever in Bali again, I know I’ll be paying a visit to The Temple Lodge, and if you have a penchant for unique lodging in magnificent locations, you should too. The Temple Lodge states on their website that they do not accept credit cards as a method of payment, only bank electronic transfers. It seems like cash would also be an option, but if that’s how you plan to pay, it would be best to send them an e-mail to make sure before you find yourself in a sticky situation. I paid for our entire stay in advance via PayPal - a nice hassle free option. WiFi is available and was pretty fast in our experience. The on site restaurant is fairly pricey, but fortunately The Temple Lodge is located within walking distance to a number of restaurants since lunch and dinner are not included. Our go to was the restaurant at Bingin Family Bungalows where an entree will only set you back around $2.50 USD. The rooms are not air conditioned, but there was a really strong fan mounted directly over our bed and a free standing fan was positioned next to the second bed. We were a little worried at first but found that with the fans on, we stayed cool and even got cold at night. If you’re not a big fan of nature being indoors, The Temple Lodge may not be for you. Our room was a regular host to geckos, lizards, and frogs, and the binder in our room stated that we shouldn’t leave anything valuable lying around our room as monkeys have been known to come in and steal things. Although The Temple Lodge isn’t located directly on the beach, Bingin beach is easily accessed via stairs at the end of the street. Be warned though that the stairs are quite long and steep, so not really for someone with mobility issues. The Temple Lodge can arrange airport pick up if you so desire for 300,000 IDR paid directly to the driver. Check in is between 1:00 and 7:00 PM and check out is 11:00 AM.